Want to cuddle with Nick Fowler? I believe that as we learn what we want and how to ask for it, our lives become so much richer and satisfying. As a professional coach I have spent years helping people at all corporate levels as well as teams explore what is possible as they learn to reflect individually and together. 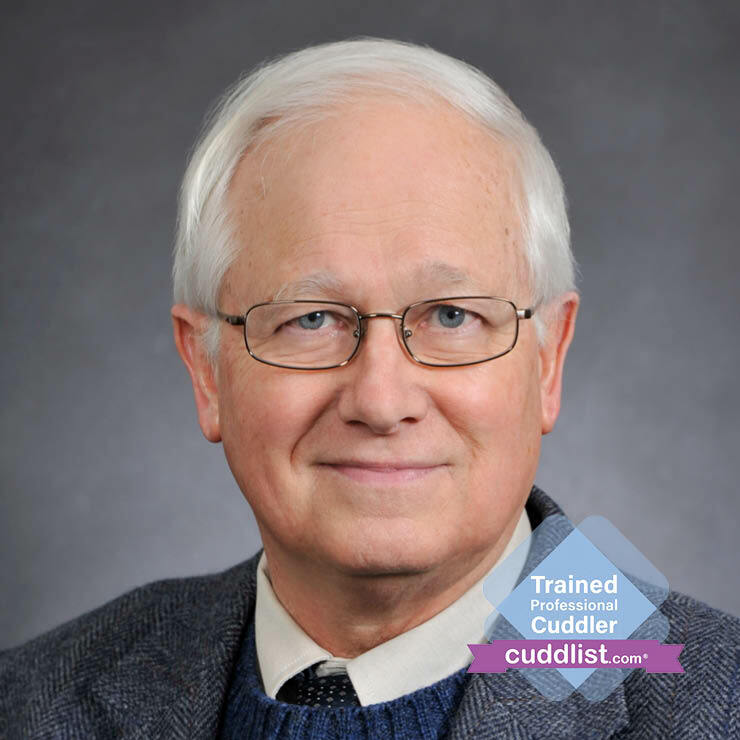 I am delighted to be complementing this with cuddling which provides practical learning in maintaining boundaries, giving and requesting consent and honoring the requests of others. This is so timely for our culture now and going forward. I am semi-retired from two decades working with executives and teams in large corporations to help them reflect on how to think and behave in ways that bring more fulfillment, and measurable success. A missing element in most of these coach/client relations, and in the team interactions, is touch – an actual real connection. I feel that this is a fundamental failure in our culture. I helped bring the Insights Discovery Personal Profile to about 50,000 individuals and teams and noted the effectiveness of inviting people to learn more about who they are, and how they interact with others. I now see cuddling as a complementary practice. As a husband, son, father, and grandfather, I see daily the impact of clear boundaries and explicit consent. And also the impacts of their lack. I am excited to be bringing cuddling sessions to those ready to take a big step to enrich their lives. Response to email queries: Thank you for inquiring about a cuddle session. As a start, I want to make sure that we are in agreement on what you are seeking and what I am offering. I am attaching a copy of our Code of Conduct. And I will be contacting you by phone to make sure you are in agreement, and to answer any questions. I will be offering sessions at several locations on the island and we can determine the closest to you during our call; or I can travel to you at a rate of $40/hour travel time. My home office is in the upstairs of my house, reached from the open parking up behind the house. There are two steps up to the door. If we meet at my home, know that I have two cats. Also, please honor my sensitivity to smoke. When you arrive, I will invite you to get comfortable, change your clothes if needed, and have some water. Please have payment in cash, check, or credit ready as we begin. We always take a few moments to breathe and shake off the days stresses. Then I will ask you how you would like to cuddle, and if you are at a loss, suggest a few ways to start. You choose. We will typically end up sitting or lying on the floor with pillows, on a couch, or on a bed. Remember the primary rule in cuddling: If either one of us becomes uncomfortable for any reason, we promise to say so and request a change. I will ask you to promise that as we start. With this in place, we can have a level of trust that makes it unnecessary to worry about what the other person needs, and also to feel free to ask for what we want – without fear of judgment. Imagine what your life would be like as you develop this skill and the abilities to help others engage in the same way. We will set a timer for 10 minutes before the end of the session, to allow some re-adjustment, letting the oxytocins be absorbed before getting behind the wheel. And to reflect together on the session and answer any lingering questions. If this is what you desire, please send me your phone number and suggested times to reach you.